I just bought this album off of iTunes based on your recommendation and the All About Jazz review. He really does get some interesting sounds with his recording approach. 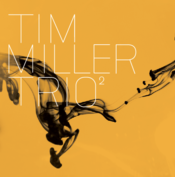 I'd never heard of the Tim Miller Trio prior to your recent post about what you're currently listening to, and the stuff I've heard so far sounds great. Thanks! No problem! Glad I could turn you on to some new stuff. I really like Miller's writing, and his playing is amazing. I agree about his interesting sounds. He uses those headless Klein guitars with the hollow chambers. I love the acoustic/electric tone he gets from those guitars.